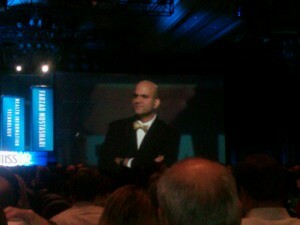 Last week we attended HIMSS12 the national conference of HIMSS in Las Vegas. The pace of adoption of electronic medical records is increasing, and Dr. Farzad Mostashari, Director of the Office of the National Coordinator (ONC) from Health and Human Services (HHS) made a breath taking statement in his key note that he expects more care to be delivered in 2013 by providers using an EMR than not. Wow – did he just suggest over 50% adoption of Electronic Health Records? Current data suggests that we have achieved perhaps 15% of U.S. Medicare and Medicaid providers achieving meaningful use attestation via a regional extension center and CMS web portal, with perhaps 30% in some stage of development of implementing an EMR. We also attended a session given by the primary author of Stage 2 meaningful use, Travis Broome from CMS. There are revisions in the attestation process, timing of incentives and also a carrot and stick for industry adoption of standards for supporting quality measures (a key driver of payment reform and the shift away from fee for service medicine) in EMRs whereby CMS can either sweeten incentives or reduce them. Although $27 billion has been put forth by HHS and CMS for EMR adoption, the real prize will be in determining who has access to the data of the EMR and how interoperability will be facilitated. Vendors who are either providing EMRs or integrating with them are attempting to both embrace the Clinical Document Architecture (CDA) as well as differentiate from their competition. One of the key questions will be how the EMR provides a foundation with the Health Information Exchanges (HIEs) for comparative effectiveness data over the life span of a patient (sometimes called the continuum of care) and whether CDA standards currently proposed will accomplish that. Informatics people call this “longitudinal clinical data.” We’ll be speaking this spring on these topics and analyzing in future reports whether Accountable Care Organization enablement is on track. While the $billions in meaningful use incentives are getting the spotlight today, the shift from Fee for Service (FFS) to evidence based medicine represents a tectonic shift in the $3 trillion health care economy. When blended with ICD-10, we have a perfect storm for innovation and redistribution of wealth in healthcare. Although ICD-10 has likely been delayed and some providers are relieved, the interaction between CMS, ONC, and HIPAA standards creates some interesting opportunities in the next five to ten years. ICD-10 will provide the underlying content of diagnosis and procedure codes that will populate the EMRs and HIEs. Keep watching the interchange between CMS, who sets the standards for Meaningful Use (i.e adoption of EMRs) and ONC that sets the standards for interoperability. And, look for vendors with vision that can capitalize on the standards while achieving commercial adoption to enable Accountable Care Organizations.